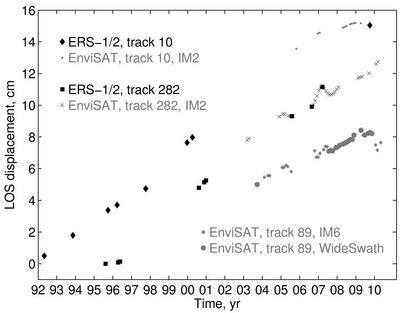 In a study published today, October 12, 2012 in Science, scientists used radar data from the ESA's ERS and Envisat missions to study an unusual uplift near the Uturuncu volcano, which had been dormant for 270 000 years. 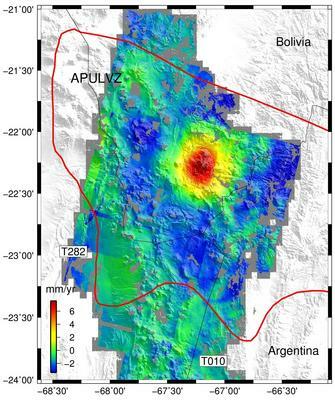 Authors of the study led by Yuri Fialko have detected ground deformation under way above a major subterranean magma body in the central Andes mountains. The deformation is attributed to a ballooning of a buoyant volume of molten rock at the top of the Altiplano–Puna magma body. The Altiplano–Puna volcanic province is part of an active volcanic arc in South America’s central Andes. Extending through Peru, southwestern Bolivia, Chile and northwestern Argentina, it is home to a number of large calderas formed following catastrophic eruptions. Beneath the surface of Altiplano–Puna, about 17–19 km deep, lies the largest known active magma body in Earth’s continental crust. Satellites show that the ground in this area has been rising by about 10 mm per year over the past 20 years, the surrounding area, however, is sinking at a slower rate of about 2 mm per year. With the wide-brimmed hat-like shape this creates, the study team has nicknamed this the ‘sombrero uplift’. “It was really important to have good data from different lines of sight, as this allowed us to estimate contributions from vertical and horizontal motion of Earth’s surface, and place crucial constraints on depth and mechanism of the inflation source,” said Yuri Fialko, Professor of Geophysics at the University of California San Diego and the lead author of the paper. The ground deformation was measured using Interferometric Synthetic Aperture Radar – or InSAR – a remote sensing technique where two or more radar images over the same area are combined to detect slight surface changes occurring between acquisitions. It doesn't matter, what the face is, that's a "ZIT"! !